After missing out on the Mouthy Stitches 2 bag swap....and being rejected from another swap as I hadn't done enough swaps.......bit like trying to get a job when you have never had one.... I found a few other swaps to join in. The very cute embroidery above was created for me by Jo, down in New Zealand - thanks Jo - It is so me, as I still love Pooh Bear. This was part of the Phat Quarter Embroidery Swap on Flickr. My partner Lyndzi said she had a love for subversive, offensive stitchery and gave me a few other clues. As I am not very good at creating things from scratch, I found a suitable embroidery on Craftster and made a "Toy Bag" for Lyndzi. It has been to America and back and then back again....and it has finaly arrived. Unfortunately Lyndzi gave me the wrong postcode...but amaizingly it arrived back on my doorstep! praise for the postal system...for once! Click here to see the bag in my Flikr ONLY IF YOU WILL NOT BE EASILY OFFENDED! I also joined the Modern She Made swap and here is my mosaic. and here is what I have made so far for my partner....i'm not too sure about it.....so I might change my mind. It is a Lynnebobsquarepants block for a pillow. I have also joined in the Scrappy Swap with Flutter Kat, but I've not started sewing that one yet...though I have found a lovely tutorial for the thing I am going to make....sorry can't say too much just yet! 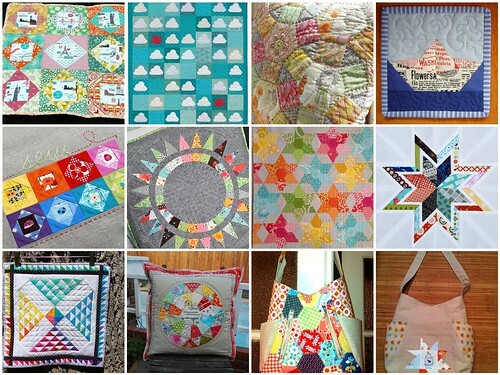 My big finish this week was my Pirate Quilt in the previous post, so if you are over from Lucy, Charm About You for the TGIFF Party, please go and have a quick look. Well I hope now that you have your swap wings, there'll be no stopping you. Lovely makes! 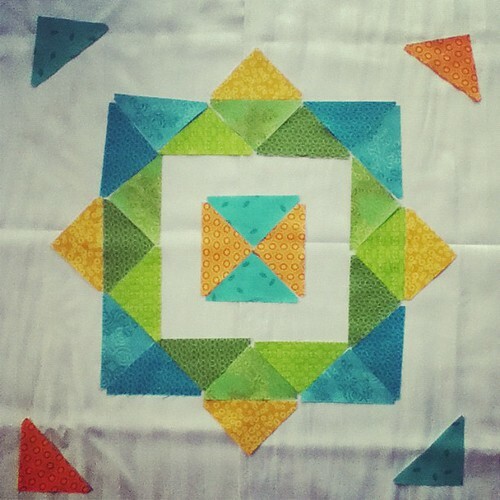 Jo's stitching is gorgeous! 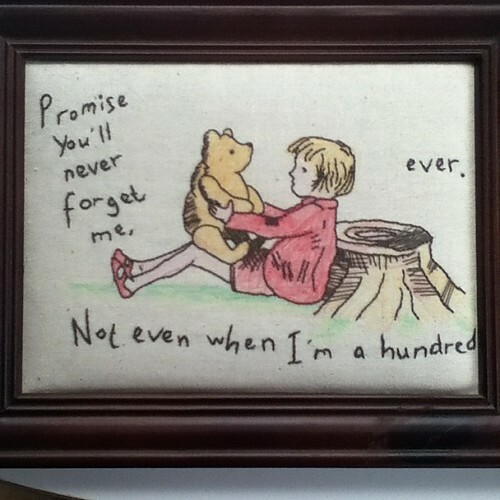 I love pooh too. I almost fell off my chair when I saw that bag... hilarious!! Not at all what I was expecting!! Thanks for linking up to TGIFF - you made my night! Thanks Lucy for the comment on my 'pooh bear'. I so loved making him. 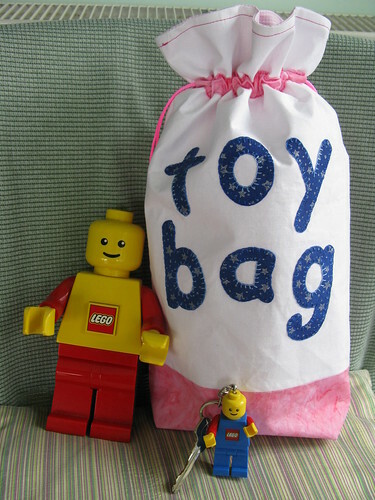 That toy bag is awesome beyond belief!!! What a fabulous idea!! !